Honour Norwegian wartime sailors with this medal cast in silver from World War II. The Norwegian people have voted their wartime sailors as the most important Norwegians for 200 years. 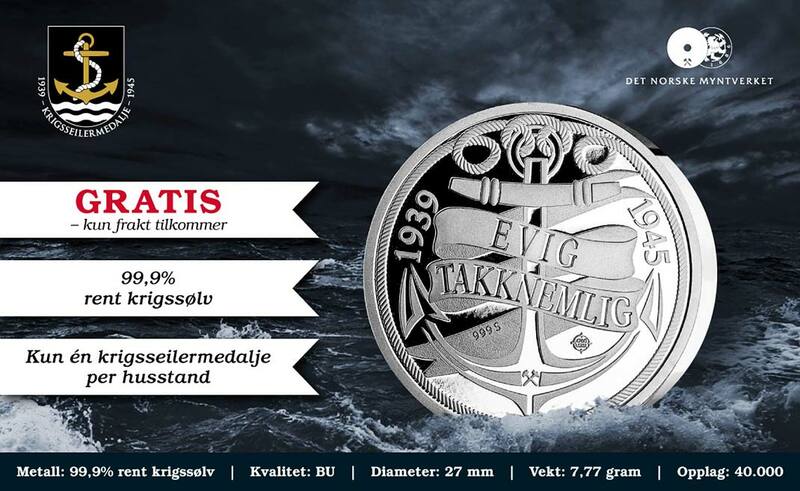 In view of the forthcoming anniversary of the liberation, the Norwegian Mint is producing a limited edition War Memorial medal that honors the many Norwegian wartime sailors and their priceless efforts. The War Memorial Medal is given away by Samlerhuset. You pay just 39kr in shipping costs. Get your medal now, while stocks last. This commemorative medal is characterized by pure 99.9% war silver from World War II, collected from 4,700 meters deep. The edition is limited to 40,000, that’s one for every war seeker who put his life at risk for our freedom. Anyone who wants to take part in the recognition of the warships and the soldiers can secure a commemorative medal free of charge, as long as they last. For the sake of fairness, there is a limit of one silver medal per household.